On this private tour, discover the cultural heritage and natural beauty of Bali, a tropical paradise that offers endless unique sights. With your guide, visit the village of Blahbatu and see artisans at work creating musical instruments. Tour an archaeological museum and see ancient funeral relics belonging to the royal family. Explore the unique village of Penglipuran, untouched by time, and travel to the Kintamani region, where you’ll see its active volcano and stunning Lake Batur. End your tour with afternoon tea at Bukit Jati while admiring stunning ocean views. 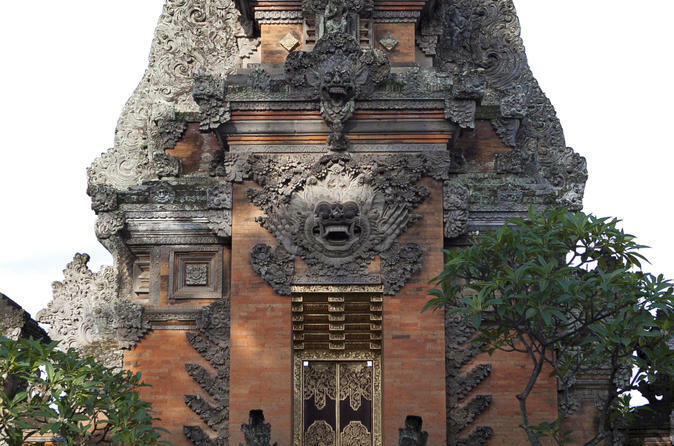 Your private tour starts with a visit to the Blahbatu village, renowned for its craftsmanship. See artisans at work as they make the musical instruments used in a gamelan, an Indonesian percussion orchestra commonly featured in religious and other special events. Next, travel back in time with a visit to an archaeological museum, where you’ll see funeral relics belonging to the royal family. Dive into Bali’s ancient past while browsing artifacts from the Bronze Age and Stone Age, and gain insight to the island’s more recent history, from Indian traders to Dutch settlers. Then, travel through the plantation village of Sri Batu and see local farmers tending crops of Eastern coffee, fruit and spices, such as cloves. Continue to the spectacular mountain region of Kintamani, known for its active volcano, Mt Batur, with remnants of lava running down the peak. At the foot of the mountain is glistening Lake Batur, the largest lake in Bali offering some of the most spectacular views on the island. Here, take some time to enjoy lunch at a nearby restaurant (own expense). After lunch, head to Penglipuran, a traditional village with unique cultural and historical characteristics. The real beauty, apart from its breath-taking surroundings, is that it remains untouched by modernization. Wander through the dense bamboo groves and see local carvers creating everything from household wares to bamboo wind chimes. Finally, stop at Bukit Jati with amazing panoramic views of the countryside and the ocean in the distance. Relax in the tranquility of this picturesque place and enjoy afternoon tea before returning to your hotel.